I was delighted to see a cogent, well-developed and brilliantly constructed article from General Melchett yesterday. I thought he had perished alongside Captains Darling and Blackadder in a hail of machine gun bullets when we went over the top in late 1917. As I heard the whistle (Darling’s, not Simon Hooper’s) of course I left cover but immediately flopped to the floor to investigate a new turnip. I’d never seen one of that standard before. I knelt and indulged. When I got back to the trench words like coward, concussion and even clever boy were bandied about. But of course, back in the 13th century I was the clever one. Dishonourably discharged and fed up with Royal Engineers, Corinthians and Wanderers I had to support a new football team. Managing to get some social housing near Brisley I soon rubbed along with the neighbours although they never wanted to borrow a cup of sugar from me. Go see Norwich they said. Now the Nest was not my sort of place. Too much chalk pit and so many rowdy flat-cappers with pint bottles of stout in their hands, so being a bit of a shape-shifter I decided to pitch up again in 2018. Mrs Miggins’ Pie Shop was in full flow, there was no sign of Dr Johnson’s dictionary but there was a Prince Regent. And Queenie was there too, which a few of the people in the ground felt quite reassuring. I think Nursey sits next to Queenie at many games. But what I do like about my new team is that: they have a cunning plan. There is no Flasheart any longer and they appear to have spent wisely on a meagre budget. While we might be on a bully beef and Queen Mary’s Christmas ration issue, we seem to have got a lot of value for our money. General Webber seems as astute as Melchett (and just as diplomatic) and while I can’t yet make up my mind about Brigadier Farke, I think he needs to be given more time. Most people I speak to agree with me, but they do wonder about the odour occasionally and tend not to speak to me for very long. Well, it’s my heritage. I can evacuate Upper Barclay D Block on my own if the turnip consumption has been particularly heavy. I struggle to attend games in modern clothing of course but a quick spin round Primark and a shirt buy at the club shop normally sorts me out. They’re not that keen on florins and groats – if only they knew (ha ha). 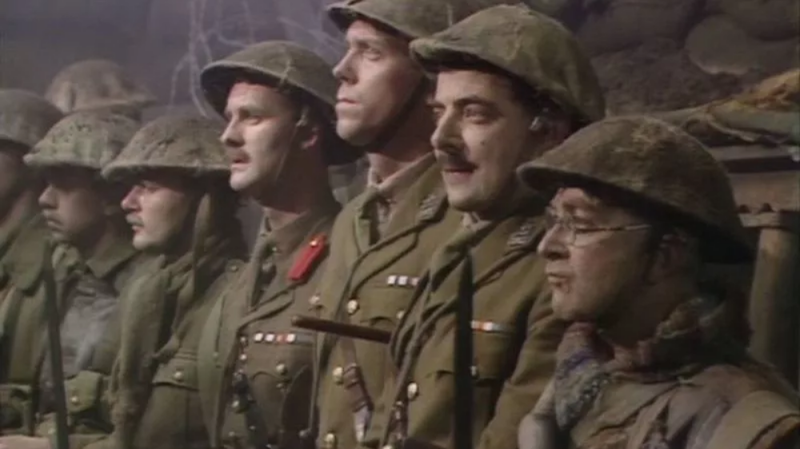 What I am really looking forward to is seeing how Brigadier Farke blends his new troops together. We have two new bombardiers up front, more midfield than you could shake a stick at and possibly even a new goalkeeper in Tim Krul – as I pencil this on a beige postcard I’ve heard nothing defining. Now in certain sections of the trenches this season, folks have crowdfunded for more noise. The boys from the Snakepit have never been low in volume. I think that will work out well in the end. God knows after four years in the trenches I can handle the volume. Plus we have the Canaries Trust and others to make the top brass semi-accountable and not every club can say that. Time to tug my forelock as Lord and Lady Whiteadder are on their way. Brigadier Farke does need more time and refreshingly does seem to have not only a plan but some flexibility too. Whether its a cunning one remains to be seen! This tactical flexablity is very Unlike that dreadful field marshal Neil who was totally inflexible. Play the same way 18 times, they’ll never expect it a 19th! Finally, has anyone seen Speckled Jim? Sorry to do a follow-up but it was hard to resist. More Blackadder than football I’m afraid, hence the lack of comments. Really enjoyed your original article. Lack of comments doesn’t mean lack of appreciation, Martin. At least, that’s what I tell myself when my pieces don’t get comments…. No offence at all meant, Martin, I normally really enjoy your stuff!! Cheers Dan – much appreciated. Shift forward to WWII when the RAF needed more time. Unfortunately the Battle of Britain was upon them and they had to cope. That is how I see this season – more time is a luxury we don’t have because failure will mean the vultures will be circling for our young prospects and we’ll have to start all over again. Looking at the players at his disposal Captain (certainly not Brigadier material) Farke has to succeed or move aside. Tippy tappy, going nowhere, sideways football will simply not do this time around. I beleive a GOOD manager could put THIS squad into the top six! Top six by Christmas or else! Phew – strong stuff there, Cyprus! Brigadier was the most obvious rank under General I could think of in a thirty-minute write and you could be quite right – can we retrospectively settle on Lieutenant? Something tells me the top six might be beyond us but I thoroughly agree that (especially in the Championship) there has to be more to life than tiki-taka. I like the look of the squad too. Our very own Stewart Lewis went to the Luton game last night and his article (http://norwichcity.myfootballwriter.com/2018/07/26/the-skirmishes-are-almost-over-daniel-farke-is-preparing-his-troops-for-battle/ ) is well worth a read.